Another shared tuna pouch with Swiss, along with sliced chicken breast and Swiss. A pretty standard lunch for us for $3.16 per serve. 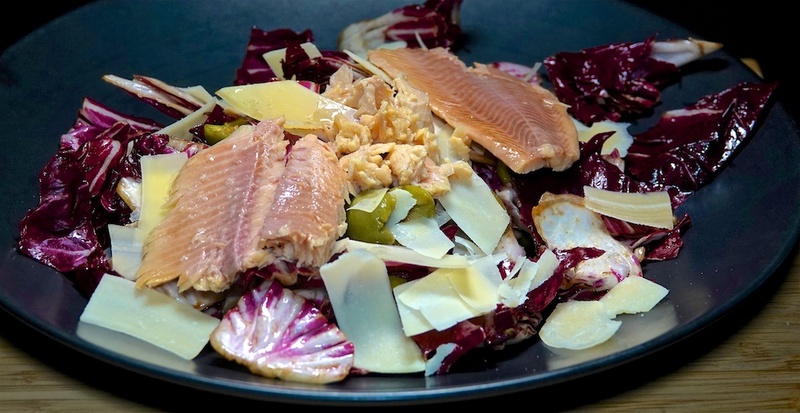 A new recipe for us: Radicchio Salad with Green Olives & Parmesan. The recipe calls for sardines, but we chose to drape canned smoked trout instead. Add 30c for the Balsamic reduction. An interesting – and tasty -salad, as long as you like the bitterness of the radicchio, which was somewhat offset by the balsamic, for $7.01 per serve.